Pneumatic actuators are used throughout the industrial process control field to provide remote or automated control of valve operation. This type of industrial valve actuator employs pressurized air to move a piston or diaphragm and apply force to the valve stem, opening or closing the valve. Since, by the general nature of their scale and content, industrial fluid processes tend to carry substantial risk related to safety and financial loss due to failure, the engineer’s task is to plan and design for safe operation, should a wide range of possible failure modes occur. Hytork, an Emerson Process Management brand, provides a solution for fail safe operation of pneumatic actuators. The Hytork Air Fail Safe Acutator is intended for use on larger valves with high torque requirements. The actuator has a built-in air reservoir that provides reserve air capacity to safely close the valve when the input air pressure fails. The accumulator stores compressed air at the highest pressure seen at the device. The design of the Air Fail Safe actuator delivers a high torque level in a double rack and pinion arrangement that is inaccessible using spring based designs. Learn about the Hytork Air Fail Safe Actuator and discuss your potential applications with a product expert. 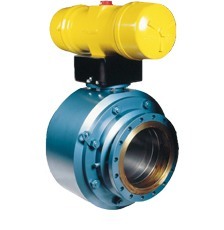 Is a Butterfly Valve Right for Your Application?